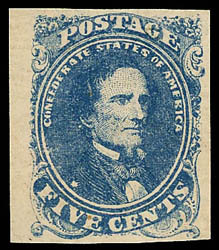 Confederacy, 1862, 5¢ blue, Stone 3, position 31, left margin single, o.g., never hinged, clear to large margins, bright and fresh, Very Fine. Scott No. 4 $750 for hinged. Confederacy, 1862, 5¢ blue, Stone 3, position 46, large margins except clear at top, beautiful bright shade, tied by "Charlottesville Va., Sep 10, 1863" double-circle datestamp on small brown piece, Very Fine and attractive. 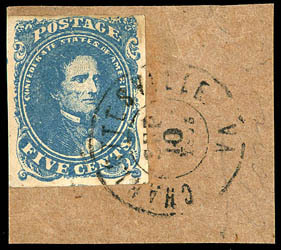 Confederacy, 1862, 5¢ blue, Stone 3, horizontal pair, large margins to close at left, tied by "Greenville C.H., S.C. Jul 1" cds cds on circa 1862 ladies cover to Society Hill, N.C., Extremely Fine, ex-Tate. Scott No. 4 Estimate $750 - 1,000. A CHOICE FIRST DAY RATE USAGE AT THE NEW 10¢ RATE. 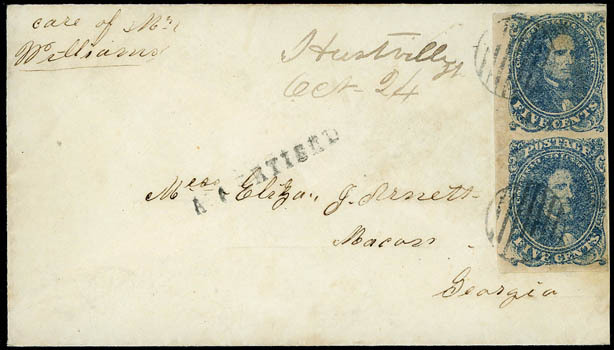 Confederacy, 1862, 5¢ blue, Stone 3, tied by "Big Shanty, Ga. / June 22" straightline postmark on dark buff cover to Lawrenceville Ga. at the 5¢ rate for under 500 miles, Very Fine and rare cancel. Scott No. 4 Estimate $500 - 750. 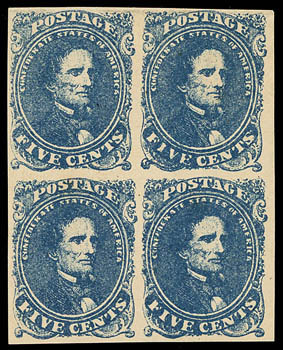 Confederacy, 1862, 5¢ blue, Stone 3, left sheet margin pair, positions 21-22, clear to huge margins including left sheet margin, tied by "Rocky Mount, N.C. Oct 14" with manuscript. 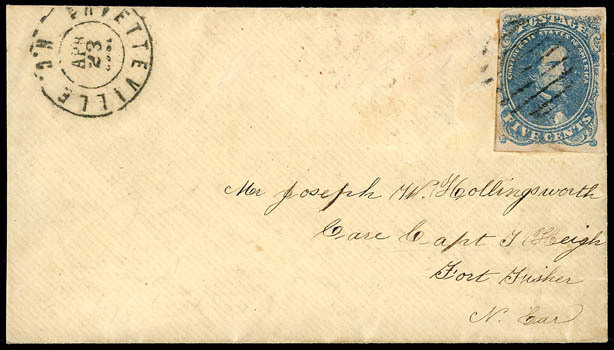 day on circa 1863 tan homemade cover to Raleigh N.C. at the 10¢ rate, Very Fine. 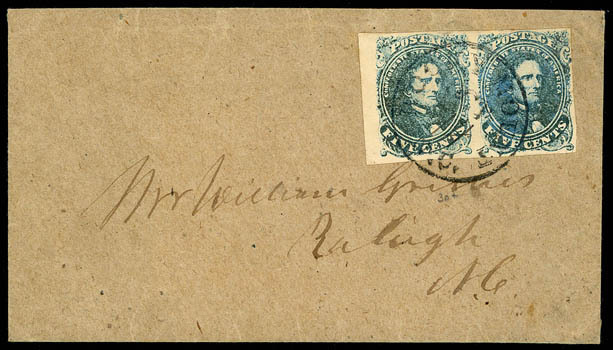 Confederacy, 1862, 5¢ blue, Stone 3, vertical pair with left sheet margin, large margins except slightly in at top, tied by neat strikes of circular grid cancels, manuscript "Hurdsvlle Al, Oct -24" postmark on cover to Macon Ga. where "ADVERTISED" straightline handstamp struck; pair with light corner crease at bottom right, Very Fine and attractive advertised use, ex-Ballard. The cover was not claimed in Macon and was advertised in the local paper as indicated by the straight line handstamp. 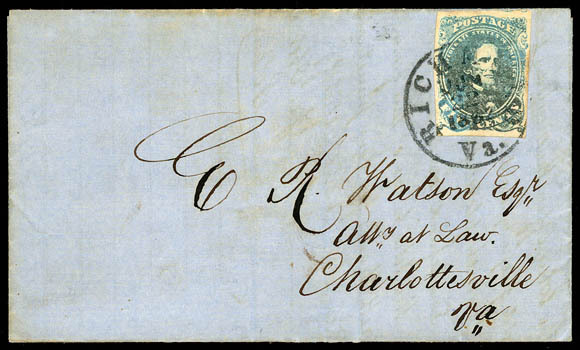 Confederacy, 1862, 5¢ blue, Stone 3, position 32, four margins, tied by "Richmond Va., Jun 22, 1862" cds (Broken "N") on blue-lined folded letter with printed "Office Insurance Company of State of Virginia" letterhead to Charlottesville Va., Very Fine; signed by Peter Powell. 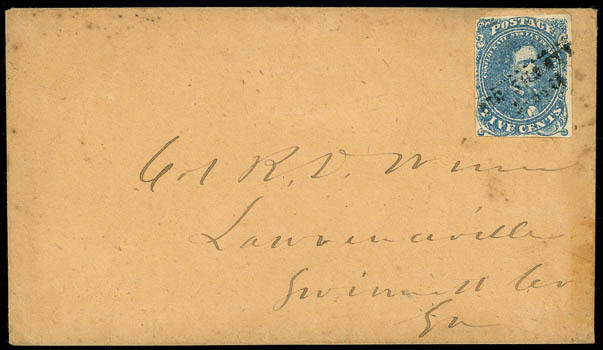 Confederacy, 1862, 5¢ blue, Stone 3, vertical pair, positions 5-15, margins to barely touched, tied by "Quitman Ms, Aug" cds on homemade light buff cover to Millard Ga. at the 10¢ rate; pair with light vertical crease, F.-V.F. Scott No. 4; $625 Estimate $200 - 300. 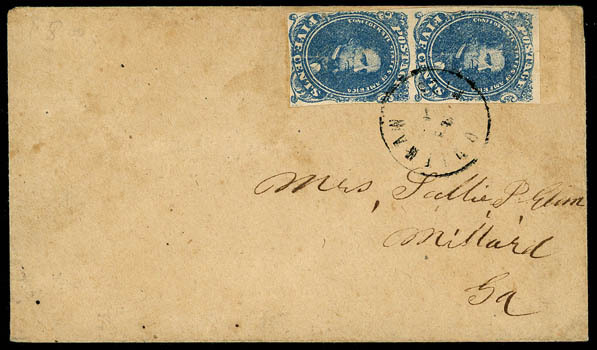 Confederacy, 1862, 5¢ blue, Stone 3, position 2, ample to large margins,tied by grid handstamp on cover to Fort Fisher, N.C., matching "Fayetteville, N.C., Apr 23" cds, Very Fine. Scott No. 4 Estimate $200 - 300. Confederacy, 1862, 5¢ dark blue, Stone 3, block of four, pos. 29-30/39-40, full to large margins, bright and fresh, o.g., never hinged, Very Fine; with 2014 C.S.A. certificate. Scott No. 4a $1,300 ++. A RARE MINT NEVER HINGED 5¢ DARK BLUE STONE 3 BLOCK OF FOUR.